There are some pretty amazing fares available from Toronto that allow you to visit both Hong Kong AND Shanghai, China for just $674 CAD roundtrip including taxes. $674 roundtrip to either destination on it's own would be an amazing price. The flights involve using a combination of Air Canada and Cathay Pacific. toronto, yyz, flight deals, air canada, asia, east asia, china, shanghai, pvg, hong kong, hkg and cathay pacific. 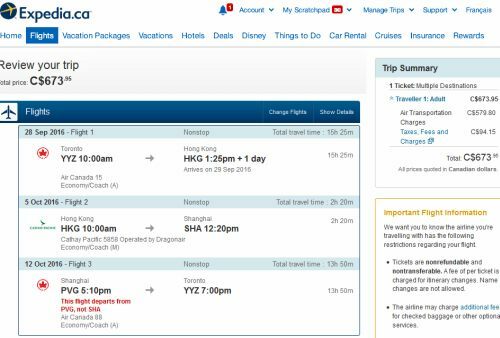 4 Responses to "2 in 1 trip: Toronto to Hong Kong AND Shanghai, China - $674 CAD roundtrip including taxes"
Works and booked! You may want to book via an actual Travel agent if you don't want t transact with an online vendor. It worked for me. Thanks YYZdeals! !